Private lessons are considered the best way to learn an instrument but sometimes you may not want to take lessons but just learn from home by watching Videos. We understand (I’ve done that myself sometimes). The problem with free videos (from say, YouTube) is that they are low quality, you might pick up bad habits (because nobody oversees the teachers and anybody can show you stuff), and after hours of watching you still don’t seem to be learning anything. That is because they are free videos to bait you into coming to their subscription site. Enter the Professional Guitar Video sites. There are a few out there and I’ve tried them all. I will give you a list of my top three: TrueFire (the best); 99cent guitar lessons (they cost more than this); and another site that is a subscription service (whose name I will post as soon as I double check, so as not to send you to the wrong one). The rest are…well…not my pick, as far as worth the time and trouble. Far and above, TrueFire is the absolute best (and have been for a very, very long time). Below are some of my recommendations for which videos to get from TrueFire to kick-start your Guitar Playing Abilities! 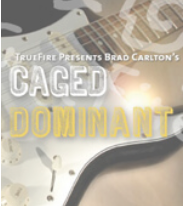 Brad Carlton’s Caged Dominant is one of those really special courses that come along every now and then that make you wonder what you would do without them. First things first, Brad is a really amazing Educator but his straight-ahead, no-nonsense style makes for a lot of hard work and it’s up to the student to make it fun later, after working a lot of the copious information out via heavy wood-shedding. But this one is a little different somehow. You still get the same instructor with the same serious approach but the material and the extra hints make it fun, almost exhilarating to study to. It’s as if Brad reserved a special fondness for this elaboration of his caged approach to the dominant 7 chords and arpeggios. The approach is exactly the same as most of his other caged series: the various caged forms of the dominant 7 up the fret-board with their roots on various strings, along with their arpeggios, relevant scales and modifications thereof. These modifications are where Brad let’s his hair down a little and shares a lot of really really cool variations (b5; b3 to 3 extensions and grace-notes, etc.). Put in the study and you will become an expert at dominant 7th chords; and you know that will take you very far in most contemporary styles of guitar. In addition to revving up my knowledge (and consequently my playing ability) in the idioms of blues, jazz, gospel, swamp, pop, and funk by a significant measure, I discovered an added bonus equal to the first: with Brad’s really comprehensive system I found myself effortlessly coming out with dominant 7 riffs by the bucket-full. This fact alone makes the course indispensable. 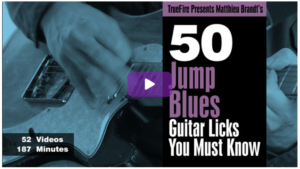 Matthieu Brandt’s 50 Jump Blues Licks is exactly what you need if you want to get that cool jazzy ‘Jump’ blues sound, without wasting time anywhere else or going after it piece-meal. Everything you need to become a real-life player of this special genre is right here: what scale to use; the chops you use; how to apply the chops in various areas of the guitar neck (in fact, linking them end-to-end covers all the useable notes of a wide expanse of the neck vertically, and fills it up horizontally); and whatever theory you might need (not too much, really; it is after all playable blues, but Matthieu gives you the skinny on what is going on with the pertinent notes in the chops vis-à-vis the chord it is interacting with). In addition extra applications are provided for extending the basic forms and special situations. He gives you some good turn-arounds, too. You will be a playing ‘expert’ in no time at all with Matthieu’s masterful course. He has a dry wit and is seriously funny too, on a couple of occasions.